We're getting to that time of year where life starts to pick up and before you know it you're so beyond busy that you barely have time to blink. You know what I'm talking about - yes, the winter holidays and Christmas (and for those of you in the US or with dual citizenship, you've got Thanksgiving to throw into the mix too!). Oh yeah...it's going to get nuts. There's holidays parties and dinners to plan or attend, gift knitting and/or crafting to do, holiday decorations to make, special recipes to bake (and eat! )...the list goes on and on. Usually when it gets this busy or when I put a lot on my plate, I start to feel a little like a chicken with my head chopped off. That is, unless I have a game plan. So this year, I've decided to plan ahead. I've made up a month-long schedule that breaks down which days are dedicated for which craft and project, which days will have a blog post, and when my deadlines are. Normally when I have a project I would make up a reverse calendar and that totally works every single time, but with so many projects on the go and with trying to knit and sew, I don't want to get flustered with trying to figure out what to work on first and wonder if I'll ever get anything accomplished on time. So planning and organization is must! Pre-planning blog posts will be a new thing for me, as I usually just go with the flow and blog whenever I have the time, but I recently discovered that all the big name bloggers pre-plan their posts. Hmm...so that's how so many bloggers have such lengthy or several posts every day! 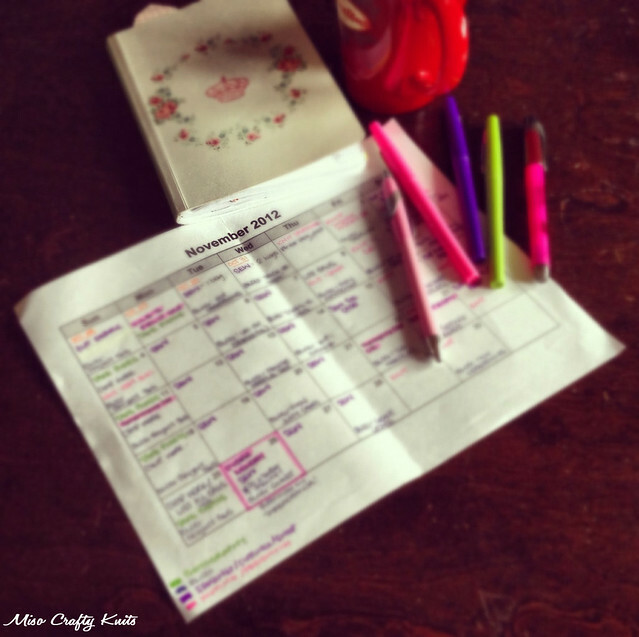 So for the month of November I'm going to give pre-planning blog posts a try. Nothing is set in stone and I'm not going to stress out if a post doesn't go live the day it was planned for. It's also kind of nice to see what I want to write about all laid out in front of me and will totally help me prepare in advance so that I'm not up until the wee hours of the morning trying to type out a post that makes sense. There are topics that I've been wanting to blog about for ages now and never got around to, I've got a notebook full of pages of blog post ideas and I think it's time I start typing some of them up. Fingers crossed that all this planning will lessen the stress and get everything done that I want to get done. Ok, with that said I need to search the interwebs for teacher gift ideas (I've got 3 to make! ), knit a few inches on a cardigan, swatches to sort out, and finalize a few gift ideas. Is anyone else planning out their month or holidays?